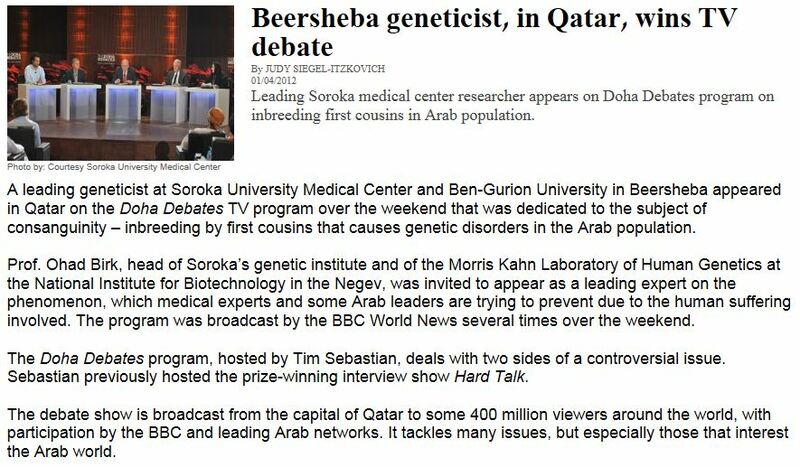 ISRAELI SCIENTIST WINS DOHA DEBATE IN QATAR ON 2ND COUSIN INBREEDING……. – The Tundra Tabloids……. ISRAELI SCIENTIST WINS DOHA DEBATE IN QATAR ON 2ND COUSIN INBREEDING……. This practice devastates Muslim communities, how many more crippled babies have to be born before society reacts? Previous Post Previous Post KSM TO GITMO FOR TRIAL IN ROLE IN 9/11 ATTACKS……..
Next Post Next Post TUNISIAN SALAFISTS THREATEN CHURCH IF THEY DON’T COVER UP THEIR CROSSES WITH GARBAGE BAGS……. They’ll debate a lot of things in Qatar to give a look/feel of democracy. However, they typically don’t debate government policy. In the mean time, it is at least noteworthy to see that Qatar is not strictly boycotting Israeli academics. This problem trancends islam, because first cousin marriages happen all over the world in many cultures. I see a possible uptick in the demand for all sorts of medical equipment, specialized staff, housing, research & development, etc. due to demographics in Britain, but not only there.